← David Cameron on the Brink of Insanity? Next Thursday the Brits go to the polls to decide whether the UK will leave the EU, having been battered from both sides with predictions about the economy and immigration. However, how about an unbiased prediction of the political scene after the Referendum, whichever way it goes? One thing is for sure: it will never be as it has been. But there are numerous possible outcomes against a background of a Tory party split down the middle, Corbyn only 70% sure and he and Cameron appearing side by side on stage. Likewise Sadiq Khan and Cameron. It’s unheard of for two political opponents to come together whilst their members defect. You don’t come back from that. The big question is whether the current two party set up will continue or whether new parties will come together to compete or take over. I am thinking about a “British” party wanting to be out of the EU and a “European” party wanting to be in – whatever the result. At Westminster I predict that a jubilant David Cameron, faced with a split party and having made his name, will retire blaming exhaustion – his credibility and that of the party remain intact. He will no doubt get a plum job in the EU (although there may be some in Brussels who wonder why he allowed a referendum) and the multinationals will be queuing up with directorships. Will Boris succeed him? Perhaps not as he is seen as a little off the wall. Maybe Gove who has performed well. Or will the Remainers in the Tory party pull another disappointment out of the hat? Will Boris pull Farage in, or maybe form the new British party I mention above. Probably unlikely that they would team up, as they would have done so already. An early general election is on the cards and, if Remain win the Referendum, almost 50% of the population will be disenfranchised voters. UKIP or son of UKIP will be a major player and could surprise. Labour will stand no chance unless they get a more charismatic leader. And the Conservatives will have lost many MPs so will be of less significance. At Westminster Cameron will resign, so he’s leaving either way. Boris and Gove will be vying for the job, but so will others from the existing Remain camp who are a majority in the party. Hard to call the future for the Tories. Will a new “Get Back In” party evolve. I don’t think so. Labour will see an opportunity at the next election, with a new leader. But a Tory party with new faces under new management will probably win the day. I actually think there will be a big anticlimax with everything settling down quickly and soon back to normal, with a few lawyers making mega money redrafting laws and agreements. In Brussels panic will set in. They will not introduce penal tariffs or travel restrictions. They will be preoccupied with how they deal with Greece, Italy, Austria, France and even Germany where anti-EU feeling is rapidly rising. Holland is next in the queue behind us with the others close behind. Just yesterday Germany’s Foreign Minister, Frank-Walter Steinmeier, predicted the imminent disintegration of the EU. I make no secret of the fact that I want the UK to Leave the EU but I hope you will agree that this article is unbiased. I can actually only think of one politician who I respect (Dennis Skinner – I don’t agree with his politics but I admire his commitment) and I have no time for the others. What I would like to see come from all this is that we end up with a trading club, just as the EEC was in the beginning. And I’ll wager a very significant majority of the electorate, including those from Remain and Leave, would like to see the same. What do you think? 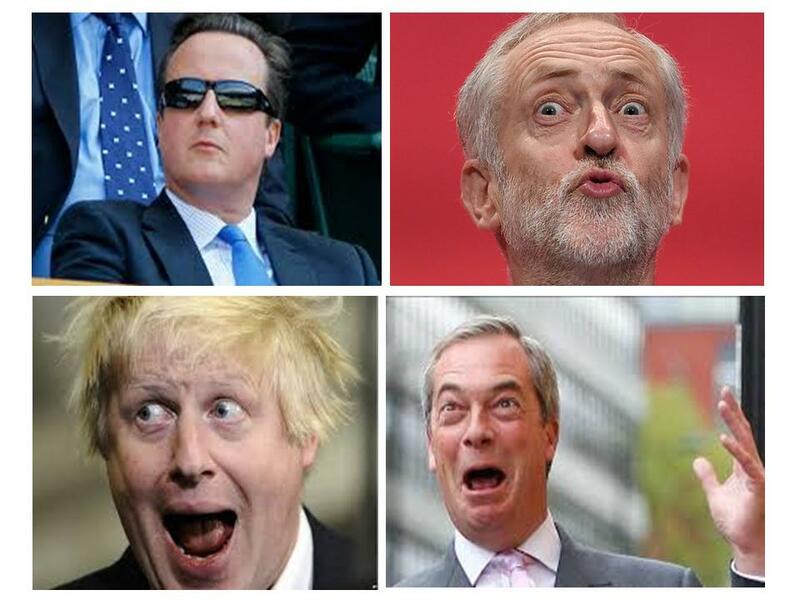 Why not post your own predictions for the post-referendum political scene?